Join us for the 6th annual John Morris Classic featuring Late Models, IMCA Modifieds, IMCA Sport Mods, Pure Stocks and Robert Horne Ford Bombers this Saturday and Sunday night May 26th and 27th. 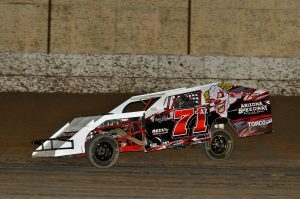 SWDRA Late Models headline along with IMCA Modifieds in their first trip to the speedway in 2018. The popular division shows John Cornell leading the field to date followed by Craig Parker, Bruce Duckett, Jerry Fincher and James Laing. The Southwests best modified stars will battle for a $1000 payday and $80 guaranteed to start the main both nights. All Arizona Speedway track championship chase’s are underway for 2018 but the local series will be joined by outside contingent this weekend while teams from across the entire region make the trek to Arizona Speedway. IMCA Sport Mods will also look for the largest payday of the 2018 season with $500 going to the winner each night in the heated division. Teams from across the region will be on hand for this growing event. Pure stocks and Robert Horne Ford Bombers will also see elevated purses for the entire weekend event with the Pure stock main paying $350 to the winner and the Bomber main paying $150 to win. Lady Stocks will race Sunday as well. Please remember the mandatory 78 series Schoenfeld muffler rule will be in effect for Mods and Sport Mods all weekend. Pill draw will be paid once for the entire weekend and will be $40 for Modifieds and Sport Mods and $30 for both the Pure Stocks and Bombers. All divisions will also be ran off of a draw redraw line up both nights not points average for this special show. Racing action begins at 7:30pm this Saturday and Sunday night May 26th and 27th . Cost of admission for this special event is $15 all adults, kids 11 and under are FREE!!!!!! Pit passes are just $30 for adults, $15 for kids 6-11 and kids 5 and under are FREE!!! Spectator gates open at 5:00pm and pit gates open at 4:00pm. Arizona Speedway is located within ET Motopark 5 miles south of US60 on Ironwood dr. just 5 minutes from Mesa, AZ. 48700 N Ironwood Dr., San Tan Valley, AZ 85140. For more info log onto www.Facebook.com/ArizonaSpeedway or call 480-926-6688 .